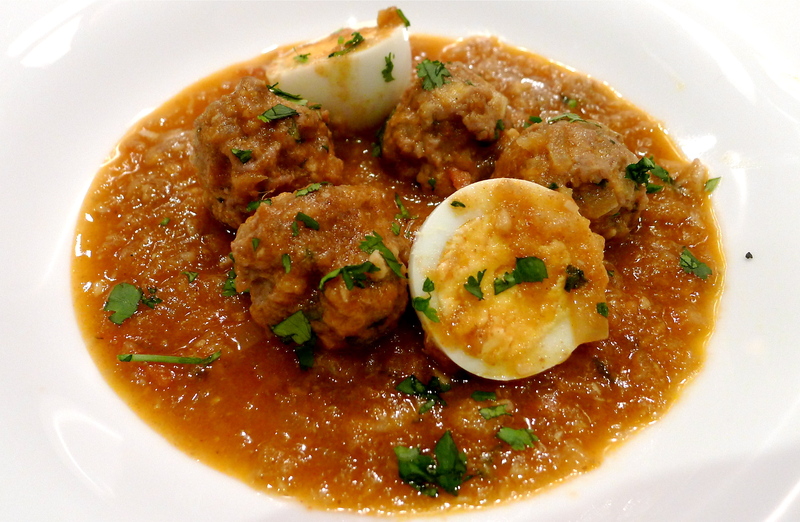 You will probably never have come across koftas (pronounced kohf-tahs) with eggs before. It’s possibly the most authentic Pakistani recipe because it’s so unique. I mean, meatballs with boiled eggs? Who does that? Is it still 1975? Yes it may look a bit odd, but there’s something about the combination of spicy meatballs, velvety eggs and rich masala that makes this dish completely melt in the mouth and a little bit special. If you detest boiled eggs (like my big brother) then leave them out. If you’re ambivalent, give it a go. And let’s face it, it’ll be more of a talking point among your dinner guests than chicken tikka masala (yawn). And your kids will think it’s fun! Classic 70’s kitsch that just happens to be yummy. First make the meatballs. Put the mince in a large bowl. Add the diced onion, salt, chilli, coriander, and a little bit of the beaten egg. Mix well with your hands to combine. Lightly flour your hands and start to form the mixture into golfballs. (It’s up to you how big you make them). Keep rolling them between your palms to make them as smooth as possible. If you need to add more egg, then do, but you should really only need a little bit. (If you’ve taken the time to finely dice the onions, it will be easier to make the correct shape.) Refrigerate the meatballs while you make the masala. Hardboil 4 eggs and set aside. Pick a large pan that will accommodate all the meatballs you’ve made in a single layer if possible. Heat 3-4 tbsps oil on a medium heat. Add the onion and cook through for 5 mins. Add the garlic and mix through for 5 mins. When the onions are a deep golden brown and the garlic is soft but not burned, add a cup of water, the tomato, salt, coriander, chilli, ginger and mix. Cook it covered on a medium heat for 10 minutes or until the masala is reduced and the oil separates out. At this point you can use a hand blender to smooth out the masala if you want. 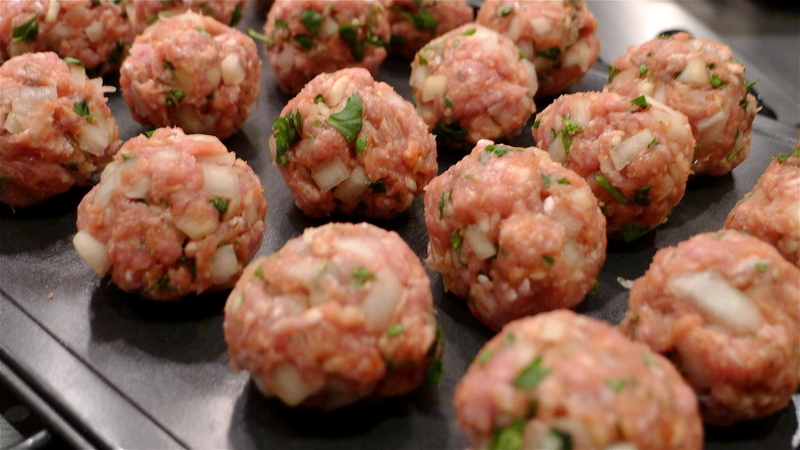 Add 1 or 2 cups of water (depending on how saucy you like your food) and gently add the meatballs. Cook through on a low to medium heat for about 20 minutes until the meatballs are cooked through, gently turning them from time to time and spooning the masala over them so they get nice and brown. When the meatballs are ready, gently add the boiled eggs, warm through, spooning a tiny bit of sauce over them. Serve, scattered with chopped coriander. Goes really well with rice, especially rice and peas! 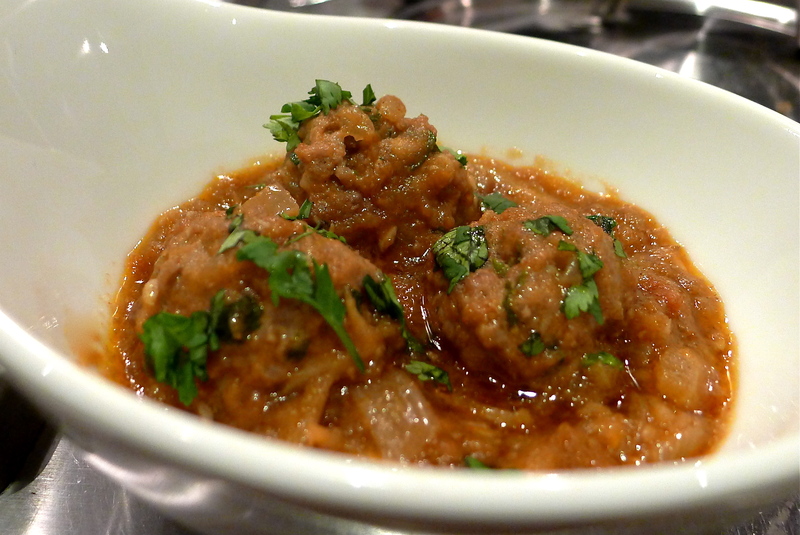 do you simmer the curry with meatballs covered or uncovered? It doesn’t matter really – I usually cook it uncovered at that point. Good luck! We eat a lot of curries, but this is the tastiest thing I have cooked. My wife sat eating it in silence and just said “wow” at the end. Yup! Like most of the recipes on here. Just be gentle when defrosting the koftas, and obviously don’t freeze the eggs! Can i use chicken meat instead of lamb?